San Marino is located near Italy and is one the smallest countries in Europe. San Marino is popular for tourism throughout the year with Summer and Winter being the busiest months for travel. During winter the mountains are covered with snow, providing picturesque scenery for romantic getaways and site-seeing travel. Whether traveling for a luxury vacation or business, our San Marino charter brokers can arrange private flights to/from anywhere in San Marino and neighboring areas. Since San Marino does not have it’s own airports, Jet Charter Europe utilizes neighboring countries such as Italy for private charter clientele. Travel to Europe using our San Marino private jet charter service which also can arrange ground transportation to/from the hotel of your choice. San Marino provides four and five star hotel options for luxury vacations or business travel. The below list of luxury hotels are based on many factors including Jet Charter Europe passenger feedback, location, amenities, and online reviews. Once arriving into San Marino via luxury private jet, our San Marino jet charter service brokers can also arrange ground transportation to/from the hotel of your choice. 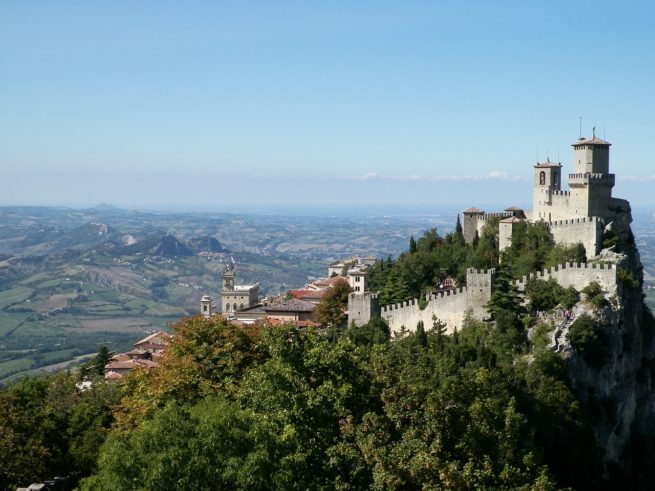 Travelers choosing San Marino as their destination to visit within San Marino, will experience cultural history, architecture, and religious sites. The choices are few, but these are some of the top destinations while spending time in San Marino. The oldest of the Three Towers of San Marino, constructed in the 11th century. Standing at 739m above sea level, Mt. Titan is the highest peak in San Marino. You can see Cesta Tower from practically anywhere in San Marino. It is one of the Three Towers of San Marino, and its height is almost daunting as one approaches it. Built in the 13th century. This fortress is very large, sitting on top of a steep cliff face. As you walk along the top, it has lots of twists and turns, and the elevation changes several times, but it gives a glorious view of the countryside. A gorgeous piazza with a sculpture by Stefano Galletti, depicting a warrior advancing whilst holding a flag. A top it is a crown with three towers representing the walled city of San Marino. Palazzo Pubblico is the town hall of the City of San Marino, and is a very iconic building. It is not open to the public, but the architecture and views are worth a visit. A small yet interesting building with two different designs. On the outside it looks ancient and classic, and on the inside it is modern and elegant. A very peaceful way to relax and get away from the city of San Marino. There are very conflicting views on visiting this museum; some believe it is a little pricey to view such torturous contraptions, while others believe it is worth a visit, but definitely not for the faint of heart. Request a Quote or give us a call at 1-888-987-5387 to speak with one of our San Marino private jet charter service brokers for your next luxury vacation, business trip, or special event.